Lieutenant Callum (called California, Cal or Harper) Harper punches his Captain, Laurence Decker for being incompetent and letting soldiers die on a mission we (initially) don’t learn much about. Cal has time and the option to finish things off but backs down and so gets re-assigned back to Earth. On the way for reasons unknown, his spaceship gets diverted and he crash lands on terraformed Mars. There he learns Earth has been destroyed and he’s been left with a group of army rejects who he has to wield together as a team, so they can survive. This is Cressey’s debut novel and it’s clear he’s put a lot of effort in. We’ve an action packed start and developing plot all laid out in a confident manner. It is only in the details that we find things to improve upon. To start with, our main character has four names (Callum, California, Cal, or Harper), this isn’t too difficult to keep track of, but it’s unusual and so jars a bit. There isn’t really a reason for it. Occasionally, the pace drops when we’re treated to some unnecessary backstory and there’s a fair amount of redundancy in the writing as well as looseness of perspective in places. But there is certainly much to like. The misfit survivors of the shuttle crash are a madcap bunch and you get a fantastic sense of layered character, particularly from ‘Eddy’ the enthusiastic recruit who just can’t sit still. The adventure draws you in through the variety of this group and you certainly get a sense there’s a story for each of them. 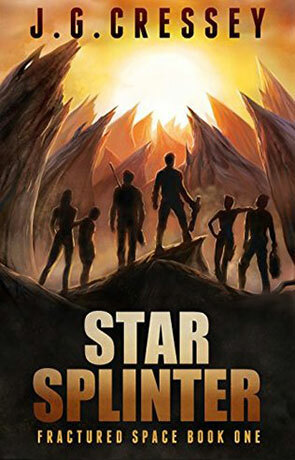 The tone of Star Splinter is difficult to pin down. There’s a feel of it being a light-hearted romp in the majority of scenes, but characters like Jumper seem like they belong in a more serious story. The family adventure feel engendered by meals at the breakfast table is contrasted by drug use and other adult content. There’s a choice or two that goes wrong and there’s a bit of a formula to the parts of the story. All the way to the end, the identity of the book refuses to settle, mixing sombre situations with childish banter and a light tone and these things never quite mesh. That said, there is much to like about Star Splinter. The book is a pleasant read from an author learning his craft. There’s certainly enough here to indicate John Cresey is a writer to keep an eye on. Written on 2nd April 2015 by Allen Stroud.